From left to right: a quart, pint, 1/2 pint, 1/4 pint, and 1/10 pint. Over the years I have been chasing a complete run of the same brand of prohibition whiskey bottle sizes: quart, pint, 1/2 pint, 1/4 pint, and 1/10 pint. As it turns out, my quest is impossible to complete, which I will detail here in a minute. Because of this, I have done the next best thing by including two post-prohibition bottles and one brand that doesn’t match but fills in the 1/4 pint slot. My original goal was to acquire an example of unopened whiskey in each size from the prohibition era (1920 through 1933). First, let’s cover the sizes. On the far left, we have a quart of Old McBrayer Brand Straight Bourbon Whiskey. As far as my research has sussed out, quarts were never sold during prohibition. What’s interesting about this bottle is the whiskey inside was laid down in 1917 and bottled in 1933 so it fits the same date range as many of the other bottles I own. Since prohibition ended in 1933, this whiskey was either taken from 4 existing pints and re-bottled, which was a common practice at the time, or it was bottled straight from the barrel (I believe it was the prior). Either way, there was a brief time when quarts were being bottled without the “Federal Law Prohibits Sale or Re-use of This Bottle” embossed on the glass (1933 through 1935) and this bottle does not have that feature. This is very neat and rare example. Distiller: Allen Bradley Co. Distillery No. 97. The next bottle, going left to right from the quart, is a pint of Old McBrayer Whiskey (notice how the word Brand was omitted). This is one of the most common prohibition era bottles you will find as a collector but is still a really nice bottle. However, this one is in dead mint condition with one of the best fill levels you will ever see, which makes it a condition rarity. Laid down in 1915 and bottled in 1933, this example boasts a 10 cent California tax stamp decal on the back, which means it was prohibition overstock and sold post-prohibition. Distiller: Allen Bradley Co. Distillery No. 97. The next bottle to the right of the pint is a 1/2 pint Old McBrayer Whiskey. Much harder to find than the pint sized version, this bottle is interesting because the whiskey is noticeably lighter, which is not a huge surprise when you consider it was not distilled by Allen Bradley Co. but rather by Joseph Schwab, Jr. Distillery No. 409. This is another example of the main brand being different than the distiller listed on the tax stamp. Distilled 1917 and bottled 1932. Continuing to the right is an extremely rare 1/4 pint of Antique Whiskey. I know of only two brands that can be found in this size with the other being Old Barbee. [Edit 10/22/17: I forgot about the 1/4 pint Old Grand Dad that pops up every now and then so that makes three] So, if whiskey during prohibition was sold for medicinal purposes what is the point of something this small, which could be easily consumed in a single sitting? Could it be this was a sample bottle given to doctors to give to their patients along with their prescription much like they do with drug samples today? This seems to be the best explanation as far as I’m concerned. Makes a great story, anyway. Distilled 1915 and bottled 1928. Distiller: The A. Keller Company Distillery No. 9 (not sure if the distillery number is correct as the tax stamp is hard to read). Unfortunately, no authentic miniature Old Taylor whiskey bottles have ever been found with one of these tax stamps that I know of. Could this stamp be a prototype? Was it ever used? 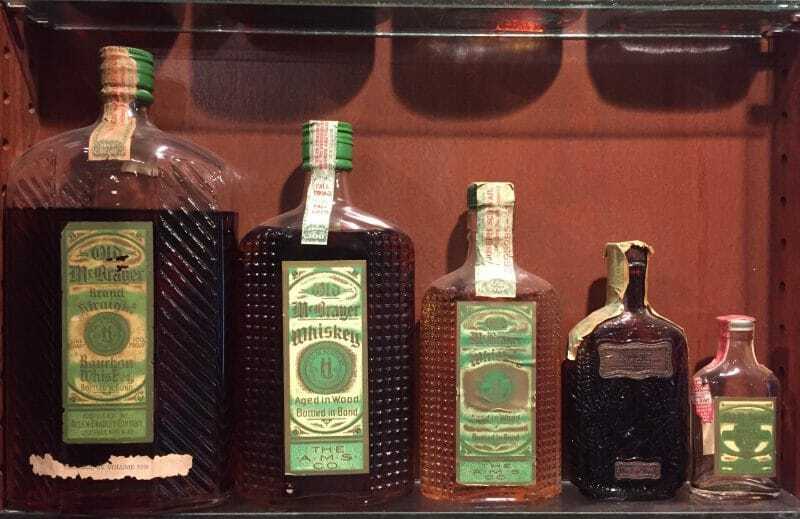 I hope you have enjoyed this post and find the history of these bottles as interesting as I do. Cheers!